Busch Gardens' Williamsburg, Virginia park began operation in 1975 as 'Busch Gardens: the Old Country', following the opening of the Busch Gardens in Tampa Bay, Florida several years before. The park was divided into themed sections representing European countries - England, Germany, Scotland, Italy - all as under a thick tree cover and surrounding a lake. Along with several thrill rides, Busch incorporated themed shops, live show performances and transportation conveniences into the experience, lush landscaping throughout. The first coaster to come to Busch Gardens Williamsburg was Glissade, a compact steel coaster design from Anton Schwarzkopf located in the Oktoberfest, Germany section which opened with the park in 1975. The following year came the Wildcat, once more a Schwarzkopf-crafted coaster that twisted through a compact layout in the Germany section, just across from Wildcat and Die Katzchen, a kiddie coaster. In 1978, following the destruction of the Wildcat, the coaster which would forever become a well-recognized symbol of the park opened to the Heatherdowns, Scotland section and was known as Loch Ness Monster. Created by Arrow Dynamics, the coaster features two lifts, a high-speed helix through a cavern, and the photogenic centerpiece of the course - and park - the first ever interlocking loops. The Monster was also a first for the park in that it took advantage of it's natural scenery and terrain. Busch liked the idea. Soon, Schwarzkopf was hired again to create a new coaster which would debut in 1986. The ride was to be the first of it's kind in America - a suspended coaster with cars swinging freely to simulate flight. But when Schwarzkopf was forced out of the coaster business, the project was sent to Arrow Dynamics. They succeeded with the design and it opened as the Big Bad Wolf. The Wolf was a hit, gliding through themed villages and concluding with a swoop towards the water below. Six years after Big Bad Wolf, Arrow was asked once more to design a new coaster - Drachen Fire. Opening in March of 1992, this thrill ride twisted through never-before-seen elements once more in the park's German section. 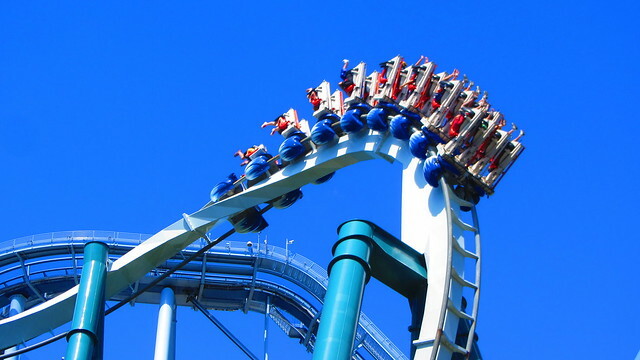 In 1997, it was again time for a major new coaster, so Busch Gardens Williamsburg contracted Bolliger and Mabillard of Switzerland to bring to life the most chilling ride yet - Alpengeist. The Alpine Ghost is an inverted coaster which opened to rave reviews and national top spots. And just two years later, Busch Gardens wanted something even larger. So B&M created the world's first raised-seating, terrain-hugging hyper-coaster and it opened to the 1999 season with the name Apollo's Chariot. But in the year 2001, something different came when Busch created their first new country in 20 years, Ireland, a themed area located on the former location of the Hastings, England section. The year after, Drachen Fire, which had been closed since 1998 due to complaints of roughness, was removed. Busch Gardens Williamsburg is annually rated the most beautiful of theme parks and has a lineup of quality attractions that make it world famous. ©1998-2016 COASTER-net.com, All Rights Reserved.